Question: We say that the principle of love for the other as for oneself is the law of Nature, but can we learn this from it? Answer: If we could learn this from nature, we would not need integral education. However, it is possible to learn from nature how to build integral systems. We see from their example that we are not able to integrate into nature and we are unable to identify ourselves with it. The problem is that no one knows how to establish balance with nature, how to achieve similarity, unity with it. Humanity cannot find the answer to this question by its own power. Here, we are needed, the carrier of the Light that Reforms. We explain to people that the world is integral, that it represents an analog system similar to our body, all the parts of which interact harmoniously with each other, while a person is like a cancerous tumor devouring everything around. Modern scientists conduct remarkable studies on this topic. The disease is clearly marked and it is clear that it progresses threatening to destroy the entire human race. What if we die out like mammoths? What if it happens in my generation or my children’s generation? What can we do? It is becoming clear that there is no remedy. After all, it also has to be received from Nature. However, researchers learn from it only in the negative. They state our oppositeness to it and do not know how to become integral. An indifferent conclusion follows: “Whatever.” Everyone finds his niche, his argument, his justification. Economists say one thing, sociologists say another, politicians, a third, and there is still no solution. They see the negative of our world (–), opposite to perfect nature (+), but cannot figure out how to achieve a balanced state, how to come to equilibrium. This cannot be learned from nature. That is why the world needs the method of correction, the wisdom of Kabbalah. 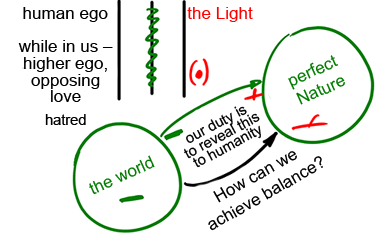 It teaches how to develop in three lines when the Light is opposed to our ego, and we know how to form the middle line between them, how to balance them. People without the point in the heart (●) cannot know that because the human ego is manifested in them, while in us, the higher ego resists love. We try to come to love and discover hatred, one that is unknown. It is possible to get along with their hatred and that is why they do not have vessels, the tools for the solution. They are like helpless children and only we can solve today’s problems. Thus, it is our duty to reveal the difference of potentials to humanity, the entire gap between plus and minus. It, itself, will not clarify the problem to the end because it does not have a solution. Why do we need to reopen the wound? Similarly, spouses avoid problem areas in order not to quarrel for nothing. Only we can understand the disease and establish its final diagnosis because we have a cure for it.